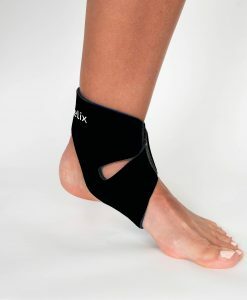 How does a Body Helix ankle wrap compare to a typical ankle brace? An Ankle Helix provides compression treatment in a sleek, simple design that fits comfortably inside your shoe and offers ankle support to the ankle ligaments, Achilles tendon and arch of the foot. With a Body Helix ankle sleeve, one does not need to know how to wrap an ankle with an outdated bandage. 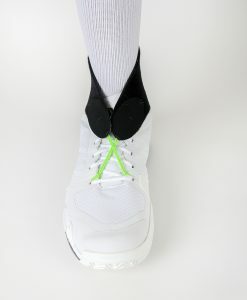 Uniform compression and ankle support is given with a Full Helix, while the X-Fit Ankle Helix provides ankle support in the “X” or Figure 8 pattern. Effective ankle compression sleeves also take pressure off ankle tendons that have been injured from ankle sprains or ankle strains. 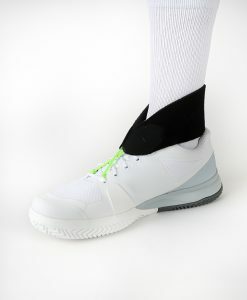 The features of our ankle sleeves are known to be beneficial in prevention of ankle injury and re-injury. Can the Ankle Helix be used for injury management? Yes. The use of compression is a recommended method to manage the swelling that occurs after an ankle injury. An Ankle Helix provides comfortable compression and support for the damaged tissues surrounding the ankle, including the ligaments, Achilles tendon and proximal plantar fascia. Should I only wear an ankle wrap after an injury? No. You don’t have to wait until you suffer an injury to use a compression wrap as they’re great at preventative care. It never hurts to wear an ankle wrap before participating in physical activities, such as sports, especially if you have a history of ankle sprains, strains or weakened ankles. Our Full Ankle Support and X-Fit Ankle Helix compression wraps are so comfortable that you’ll probably forget you’re even wearing one. What are the most common sports and activities that need ankle support? Practically, every sport from basketball, baseball, tennis, and others use the delicate ankle muscles! Those that have missed a yoga class or avoided a long run due to a sprained ankle or strained Achilles tendon understand the need for dependable ankle support. No other compression product can match the quality of our ankle wraps, making the Ankle Helix the best ankle brace alternative. Both of our ankle compression wraps utilize Form Fit Technology, are made from our reinforced super stretch material, will not absorb excess water, bacteria, or odors, and can be washed after every wear.